These photos were taken at 4 weeks old. 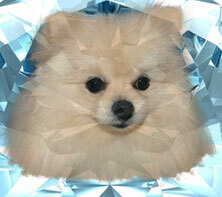 Diamond Ice Pomeranians is located in the country setting of Spruce View, Alberta, Canada. We have established a family kennel. 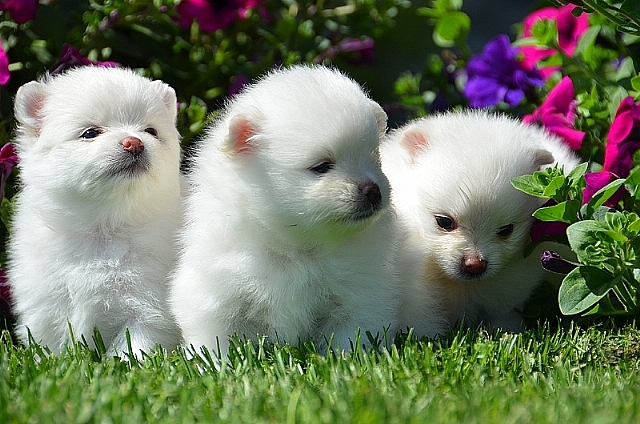 My name is Bonnie Maxwell, currently a small breeder of white and cream Pomeranians. We have now expanded our focus on Wolf Sable Pomeranians also. Over the past years this has been one of the our dreams. In the coming year we plan to reenter the show ring, Great care and a lot of thought has gone into selecting quality and conformation in our Poms. I have raised and shown White Samoyed Huskeys for years but fell in love with the Pomeranians and have now switched my focus to them. Our objective is to breed the very best that we can in order to have sound, healthy puppies with kind and loving natures. All my Poms are CKC and AKC registered. I have five breeding females and three breeding males. My Poms come from Rise N Shine Pomeranians, Wigglypaws Pomeranians, Back 40 Pomeranians, Yuma Pomeranians and Showin Pomeranians with great pedigrees and championship bloodlines. Thank you to all these great breeders for sharing their lines to create fantastic pomeranians. All my puppies come with CKC papers, vet checked, first shots, dewormed, microchipped and a health guarantee. I try to estimate the weight and colour of the puppies to the best of my knowledge at the time they leave to go to their new homes. If you have any questions or inquiries please contact me at diamondicepoms@gmail.com or 403-728-0090 (home) or 403-350-5943 (cell). Our dogs are part of our family, raised underfoot and enjoy plenty of socialization and play time. At this time our Fall White Pom litters have arrived. Our Fall white breedings were amazing. They are beautiful, quiet dispositions, very social and loving. These puppies will be going to their new homes towards the end of October. You can view photos of past puppies in the gallery and check out the current puppies on the puppy page. Please do not hesitate to call us if there are other questions you would like answered at 403-728-0090 or 403-350-5943. Thank you for your interest in our poms. We will be having Wolfsable Pom litters arriving towards the beginning of Dec. 2018. Our dreams of having our Wolf Sable Puppies has been long in coming. We would like to thank these breeders for these beautiful female puppies. Thank you Audrey Caywood of Showin Pomeranians and Betty Spitzer of Wigglypaws Pomeranians and also for our new White Female Pomeranian from Barbara Raymond of Showin Pomeranians. This is a wonderful addition to our Pomeranian family. "Showin's Classy Wolf" at Diamond Ice" from Audrey Caywood at Showin's Pomeranians. Wolf Sable female. She is absolutely a gorgeous girl. Showing will be the next step. "Wigglypaws Fancy Gray Wolf" is from Betty Spitzer of Wigglypaws Pomeranians. Black & Silver female. Very nicely put together and showable. "Showin's Little Naughty Wolf" from Audrey Caywood at Showin's Pomeranians. Wolf sable female. One of the most beautiful wolf sables she had bred. Has it all! 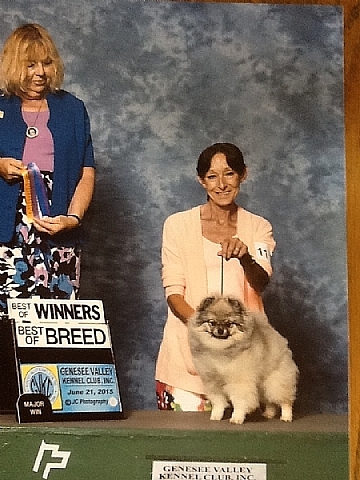 "Diamond Ice Snow Angel of Dionshowin" from Barbara Raymond at Showinners Pomeranians and David Dion. White female with beautiful conformation and show possibilities. 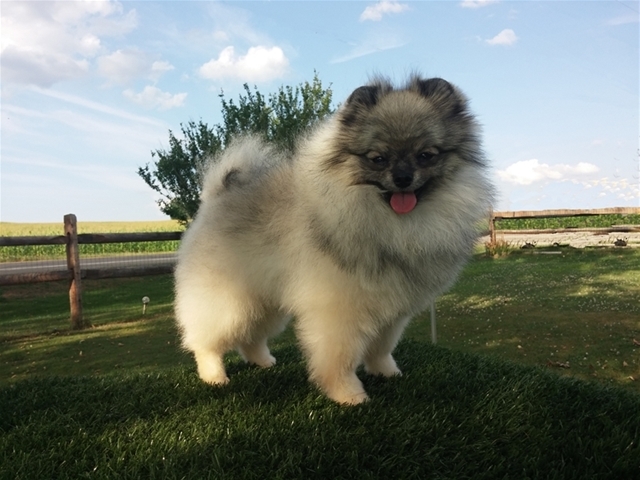 "Showin's Wolfina at Diamond Ice" from Audrey Caywood at Showin's Pomeranians. Wolf sable female Incredibly beautiful. "Showin's Sterling Silver at Diamond Ice" from Audrey Caywood at Showin's Pomeranians. Wolf Sable male. This boy has it all. He has conformation, disposition, personality and color and is very showable. We are very excited about the accomplishment of our up-coming Sire ??? in the show ring. On his first time out in the ring he placed 1st in class and reserve. On the second day at the show he 1st in class, Best of Winners, Best of Breed winning a 3 point major. In group he placed 4th out of 51 Toy Group. Quite an accomplishment. 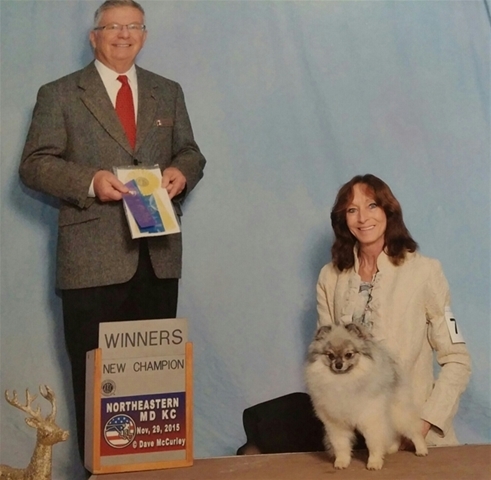 On November 29th, 2015 Showin's Sterling Silver At Diamond Ice received his AKC Championship.